Barbecue Season is upon us, at long last. To get you in the grilling mood, here's a tempting and healthy recipe from Cline Cellars' website, created by Chef Blake Mastyk of Arizona's Cartwright's Sonoran Ranch House. If you like this dish, you might want to check out other Cline Cellars recipes. In a saucepan, sauté the white onion over medium-high heat with a splash of olive oil. When the onion starts to brown, add the garlic and jalapeno and cook for 2 minutes. Deglaze the pan with the Cline California Syrah. Reduce the wine until only 1/3 of the liquid is left. Add the ketchup, vinegar, soy sauce and cumin. Bring to a boil, remove from stove and set aside. Preheat grill to high. Grill the corn on the cobb, white onion and jalapeno until they start to char on the outside. Remove from grill. Cut the corn off the cobb; dice the white onion and the jalapeno. In a mixing bowl, combine the corn, avocado, onion, jalapeno, cilantro, lemon juice, splash of olive oil, cumin and salt and pepper to taste. Grill the salmon on both sides. 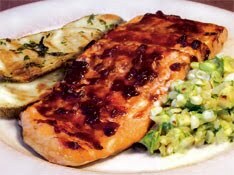 Turn the grill to medium low and brush salmon with the Syrah BBQ sauce. The salmon should take two coats of sauce on each side. Serve with a dollop of salsa.